Xurxo Borrazás is considered a leading exponent of postmodern fiction in Galician, with ten novels and books of short stories to his name. He is known for his transgressive, experimental style. His best-known books are Vicious (Criminal in Galician), awarded the Spanish Critics’ Prize in 1994; I Is, about a writer who is transported back to the time of the 1755 Lisbon earthquake; In the Suitcase, about a couple who come across a suitcase full of banknotes; and Impure Thoughts. His essay Art and Part: From the Patriarchs to Suicidal Art was awarded the Galician Critics’ Prize in 2008. He has translated notable English-language works into Galician: The Sound and the Fury by William Faulkner and Tropic of Cancer by Henry Miller. He lives and works in Vigo. 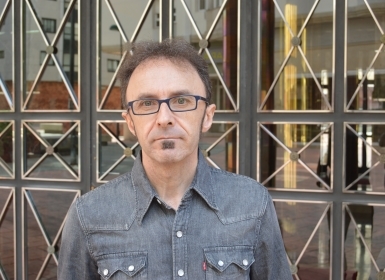 Vicious (182 pages), called Criminal in Galician, is Xurxo Borrazás’ second and best-known novel, and won him the Spanish Critics’ Prize as well as the San Clemente Prize awarded by high-school readers.